Hyundai Motor Group retracted its spinoff merger plan for Hyundai Mobis and Hyundai Glovis on Monday, citing the views of the market and shareholders that had widely been against the move. Auto parts unit Mobis and logistics arm Glovis’ board of directors each called off the general meeting initially set for May 29, when the group’s reform plan announced in late March was to be put to a vote. Mobis and Glovis instead decided to revise and improve on the measures. “We will humbly review and sufficiently reflect the diverse views and advice raised by the shareholders, investors and the market since our announcement on the restructuring of the group,” Hyundai Motor Group Vice Chairman Chung Eui-sun said in a statement. “It was with grave realization in the process of pushing forward this plan that there was much lack of communication with many shareholders as well as the market,” he said. The company will present a new reform plan that can improve business competitiveness and corporate governance along with the value of the concerned companies, Chung added. Starting with Elliott Management, which has been pressuring Hyundai to adopt a holding company structure, major proxy advisers such as Glass Lewis and Institutional Shareholder Services had opposed Hyundai’s plan citing the inadequate merger ratio of Hyundai Mobis’ module and after-sales service business, and Hyundai Glovis at 0.61:1. In March, Hyundai had unveiled the plan to split Mobis’ module and after-sales parts businesses and merge them with Glovis. Mobis, instead, was to focus on its core auto parts operations and research and development, taking charge of the automaker‘s future growth drivers including autonomous vehicles and connected cars. In the process, group Chairman Chung Mong-koo and Chung Eui-sun were to pay as little as 1 trillion won in transfer tax, a point that had earned the support of the Korean government that has been pushing for the major clean-up of the complex governance systems at major conglomerates. Critics, however, have argued that the ratio was measured favorably to Glovis to heighten the logistic company’s value for Vice Chairman Chung to tighten his grip, who according to the plan would sell his shares of Glovis to purchase a new stake in Mobis. Chung is Glovis’ largest shareholder with a 23.3 percent stake. Key local advisory firm Korea Corporate Governance Service also went against the plan, citing a lack of rationale behind separating Mobis’ local and overseas businesses within the module and after-sales service business. Due to opposition led by Elliott Management trying to sway some 48 percent of shares held by foreign shareholders, Hyundai Motor had been under intensifying pressure to convince as many investors as possible. Vice Chairman Chung Eui-sun had visited New York last week, where he was expected to have made last-minute efforts to convince the investors. 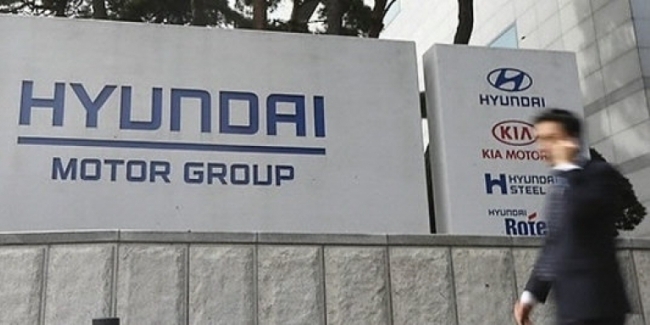 Hyundai has been facing increasing challenges in recent months along with the now-canceled restructuring plan, including the South Korean authorities zeroing in on the group and alleged irregularities. On Monday, prosecutors raided the headquarters of Hyundai Glovis over allegations that a Glovis worker had made falsified tax invoices worth about 34 billion won between January 2013 and July 2015.